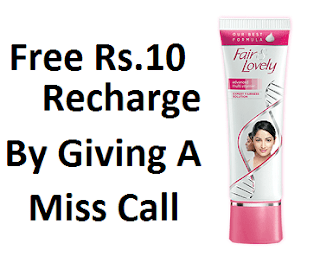 Hello Dealsnloot Readers,Fair and Lovely Loot Get Rs 10 Free Recharge on Simple Question. Yes now Fair and lovely company has come up with new offer where you will get Rs 10 Free Recharge on just Giving Simple Questions. After a long period of last offer Win Fair & Lovely 14 sachets (9 g) or Rs.120 Mobile Top-up now again Fair and Lovely is back with freebie offer. However, this time its not as big as it was last time but still good offer. This time you need to attend Fair & Lovely Beauty Class call to get Free Rs. 10 Mobile Recharge.So Hurry !!! Grab This Loot Free Recharge Offer. How to get Fair & Lovely Beauty Class call Free Rs. 10 Mobile Recharge ? 2) Call get disconnected and you will received a call back automatically. 3) Now pick up call and give answers of quiz. 4) Now Call get disconnected and on Next day you will receive a Call again and they ask you question. 5) After Giving Answers you will get Rs 10 Recharge within next 24 hours. The Fair & Lovely Beauty Class Offer (“Offer”) begins on 27th May, 2016, and ends on 5th July, 2016. There will be no acceptance of any entries for any reason after the Offer ends. The participants would stand a chance to win, by a system of lucky draw, a recharge of Rs. 10.